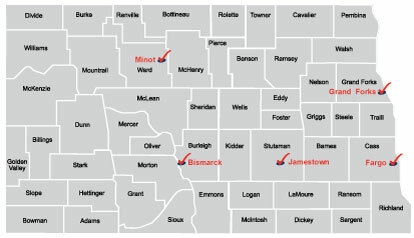 Child Care Aware® of North Dakota delivers services statewide from our network of five regional offices. FARGO 701-476-6820 3911 20th Avenue S.
Our web-based searchable database of regulated child care programs helps families create a customized list of child care programs that match their needs. Links to financial assistance to help families pay for child care. Child Care Aware® of North Dakota offers consultation and develops training to strengthen the skills of child care providers. We develop training and guide the professional development of caregivers, teachers and administrators through on-line training options, conferences and courses. Child Care Aware® early childhood consultants help child care providers develop curriculum and activities that capture children's interest and foster learning. Child Care Aware® Start-Up consultants help individuals and communities start child care and run a successful business. The quality and availability of child care impacts economic development and the state’s education system. Child Care Aware® partners with communities to implement strategies that address child care challenges and build capacity. Child Care Aware® works with community leaders, employers, law enforcement, teachers, economic developers and others to assess a community's child care needs, raise awareness and develop solutions that serve the physical, emotional and educational needs of young children and their families. Including supply and demand, the cost of child care and information about the child care workforce.